A Fascinating Transitional Bottle of Old Fitzgerald From the Dawn of the Repeal Era. When Prohibition ended, Pappy Van Winkle, and his partners A. Ph. Stitzel and Alex Farnsley incorporated Stitzel-Weller and began building the legendary distillery by that name which has aroused such passions. It was finished in 1935 and distillation began soon afterwards. But in that year between the end of Prohibition on December 5th 1933 and whenever in 1935 distillation commenced, Stitzel-Weller existed as a company selling medicinal whisky distilled prior to Prohibition from their concentration warehouses where whisky from all over ended up under the watchful eye of the bondsmen. The bottle you see at right is a window into that particular moment in history. Pappy Van Winkle had purchased the Old Fitzgerald brand name from S. Charles Herbst. He had originally called the brand "John E. Fitzgerald", distilled in Frankfort, KY for exclusive markets like steamships and private clubs. It was the good stuff, named for the crooked bondsman who knew to pilfer the good stuff - a wicked inside joke. Pappy must have loved it because he approached Herbst to buy the brand during Prohibition a number of times according to Sally Van Winkle Campbell in "But Always Fine Bourbon". She writes that Herbst demanded $25,000, but ended up finally selling it to the persistent Pappy for $10,000. According to the excellent timeline on the Bourbon Enthusiast forum Pappy's W.L. 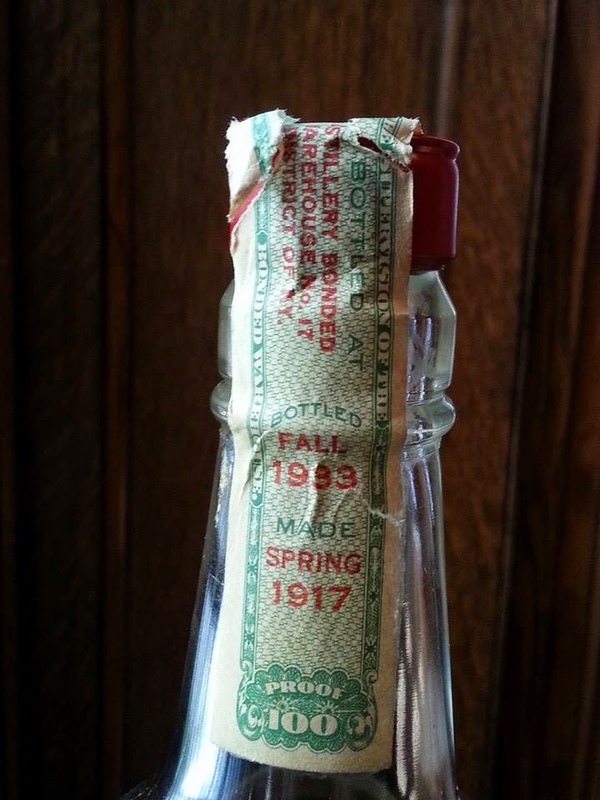 Weller & Sons bought the brand from Herbst for $2,000 in 1922 and then paid Herbst another $2,000 in 1925. 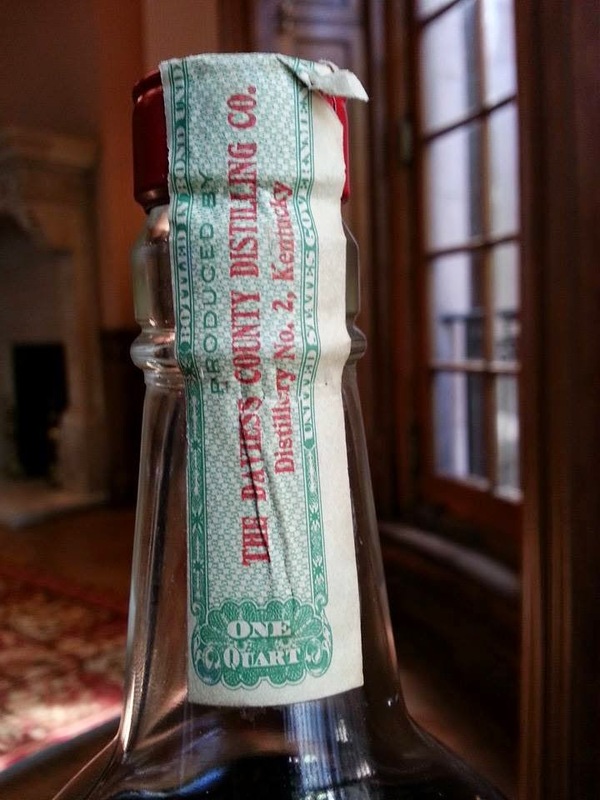 Daviess County Distillery Co., Owensboro, Ky.
A. Ph. 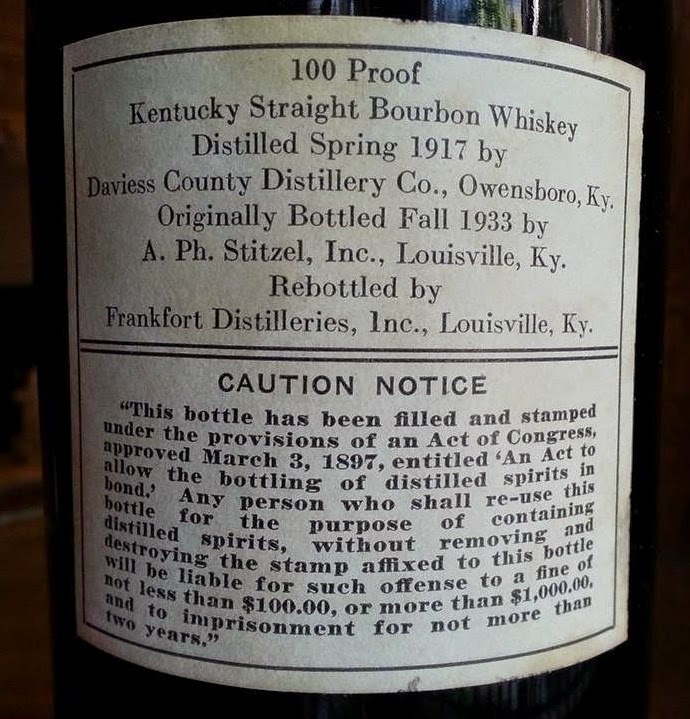 Stitzel, Inc., Louisville, Ky.
Frankfort Distilleries, Inc. Louisville, Ky."
Daviess County Distillery Co. was purchased by George E. Medley in 1901, according to Sam Cecil's book. His son, Thomas A. Medley took it over when he died in 1910. Thomas kept the company alive through Prohibition and distillation was moved to the Old Rock Springs Distilling Company after Repeal. The whiskey in this bottle is from the old Medley's production at Daviess County and as such is a real piece of history. 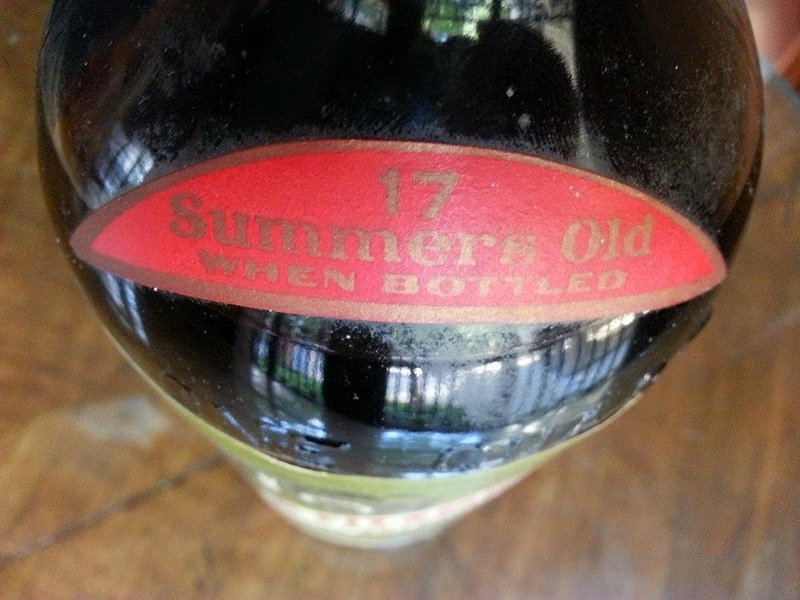 FYI - this bottle is going up for auction Wednesday 10/29/14 at Skinner's up in Boston. Joe Hyman, the leading auctioneer of whisky in the USA left Bonhams when Bonhams cancelled the Fall NY whisky auction and moved to Skinner - as documented here"
In the absence of Bonham's, Skinner may be the best hope for a vibrant whisky auction business in the US. I urge everyone who used to enjoy Bonham's auctions to make the move to Skinner. 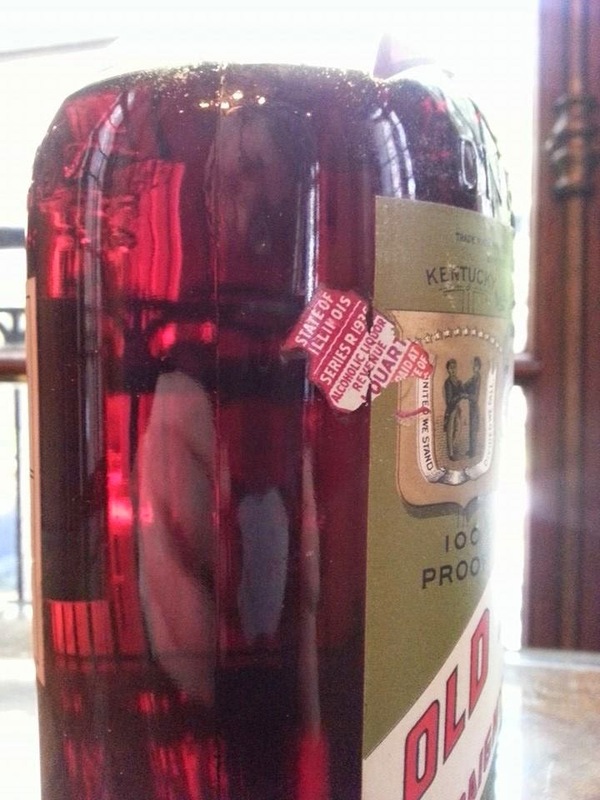 Detail pics below show the BiB (Bottled in Bond) tax strip, age statement label (characteristic A. Ph. Stitzel red crescent), and the light shining through the whiskey so you can see it's good and clear. (The consignor of this bottle chooses to remain anonymous).